Design a brand new beverage category brand that captures the sense of celebration owned by champagne and bubbles…every day. The chance to team up with Chris Archer and help him develop a brand new beverage category doesn’t come along every day. Chris’ idea was to create a lightly carbonated, low alcohol Riesling sold in small bottles – a thinking woman’s beer. We loved it and couldn’t wait to bring the brand to life. The first challenge was ‘what do we call it?’ Ritzling is a small valley in Austria where it’s thought the first Riesling grapes were grown. For centuries, many an army has marched across this land. From Caesar and the Barbarians, to Napoleon and Hitler. Try as they might, at the end of every campaign ‘happiness just kept shinning through’ and with it, the vitality of the Valley. Enchanted by this tale we were inspired to create a magical world – the land of Ritzling – where fun and optimism rule supreme and nothing is taken too seriously. These ideals informed the brand’s visual imagery and messaging. Exotic, magical images combine the spirit of Alice in Wonderland with a touch of the baroque and a hint of Monty Python. 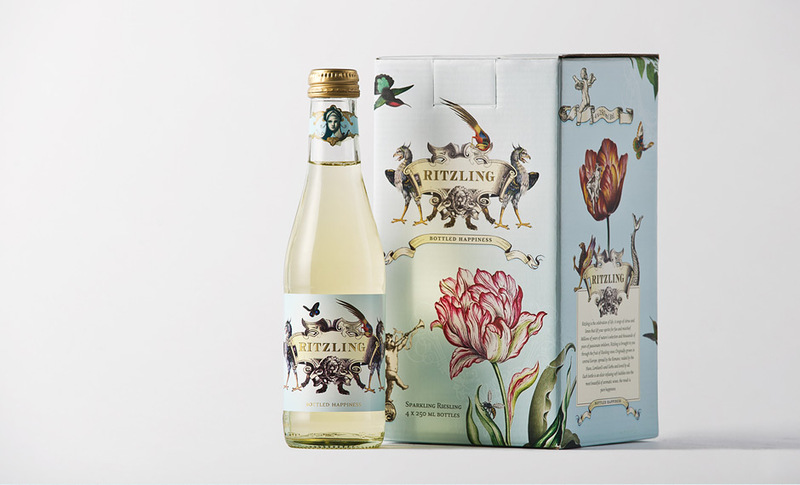 Enchanting and upbeat, the Ritzling packaging is a standout on the shelf. Ritzling launched in New Zealand in April 2011. It was an instant hit with bars and retail outlets who quickly caught on to the Ritzling positioning. By August (months before scheduled) it had sold out, prompting the early bottling of the next vintage. Team Happiness – the Ritzling advisory board – is now working to launch Ritzling internationally and spread the happiness. Brand Development, Assistance with naming, Visual ID, Brand Application: Packaging, Print Materials, Website, Social Media. Ongoing creative support of Team Happiness’ efforts to go where others haven’t.